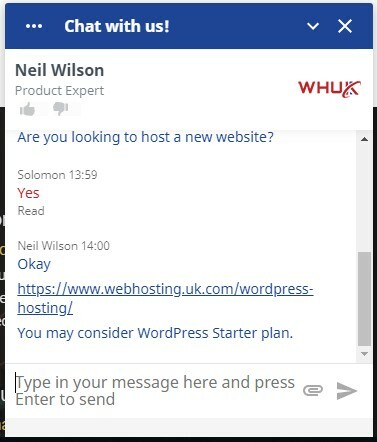 Webhosting UK Review 2019: Is Webhosting UK a Good Hosting? Webhosting UK (WHUK) has been in the web hosting business since 2001. With its fully managed dedicated servers located in the U.K., the vendor is well equipped to offer a variety of hosting solutions, including shared hosting, reseller hosting, VPS, and managed dedicated hosting solutions. WHUK is a web hosting provider established in 2001. The vendor is a privately registered web hosting company in the United Kingdom. It is debt-free and specializes in providing fully managed hosting services backed by a data center located in London, U.K. The company has been in the web hosting business for more than 15 years and boasts of a client base of over 35,000 worldwide. WHUK servers are located in the U.K. Its hardware is housed in a Tier IV facility, rated N+N for network and power, to ensure the highest possible levels of reliability. The vendor uses SSDs for its cloud servers as well as its dedicated and fully managed VPS servers. Because it only offers SSD storage, the websites it hosts typically have faster loading speeds. This vendor is best known for its cloud hosting solutions. It uses state-of-the-art Intel Xeon based cluster, enterprise-class SSD storage, and automatic data caching for blistering website performance. This makes the solution perfect for dynamic websites. What’s more, the vendor uses self-healing technology that makes sure that the server load is automatically rebalanced across its entire cloud infrastructure in the event that a piece of hardware fails. In addition, WHUK’s geographical redundancy is the vendor’s guarantee to its customers that its systems will remain functional even in the event that a whole data center goes down. WHUK offers free daily and weekly offsite data backups stored in two different geographical locations to ensure that you never lose your files again. The vendor stores each backup for seven days at no extra cost. What’s more, the company allows customers to request an unlimited number of restores free of charge. Backup is also done from physical and virtual infrastructure that uses OpenStack, Hyper-V, VMware vSphere, and Virtuozzo providing reliable and secure cloud storage and disaster recovery. Furthermore, all its clients’ website data is mirrored across multiple physical devices in extraordinary redundancy efforts that few vendors can match. WHUK’s web hosting solutions are pretty cheap. The vendor allows users to pay per month or once a year. Customers who commit to a 12-month contract gets a free domain. The vendor lists the prices of its hosting plans in euros. It offers a 30-day money-back guarantee and an uptime guarantee of 99.95% backed by a compensation plan. The compensation plan gives users a refund of 5% of the monthly service fee for every hour of network downtime recorded on its servers. You can reach out to the WHUK support team via telephone support, email, live chat, and ticketing system. Its support team is available 24/7. They are polite and helpful and their response time is extremely short. They also seem very well-versed in all things hosting. The vendor has a rich knowledge base that offers additional help and answers pertinent to customer questions. With a client base of over 35,000, Webhosting UK is a relatively large web hosting company. Its heavy investment in hosting infrastructure and its polite, expert support team are just some of the reasons many individuals and businesses have stuck with it for years. Its array of hosting solutions also endears it to many even beyond the U.K. Whatever your hosting needs, you can bank on WHUK to deliver even beyond your expectations. Wondering how Webhosting UK stacks up against other Web Hosting companies? Enter any other Web Hosting company and we will give you a side-by-side comparison.